No matter where you lie on the political spectrum, the feat that Donald Trump pulled off in November to win the presidential election was impressive. Why? Because Trump didn’t so much as run an election as sell a brand, and that brand did exactly what he intended: identify a target audience, and deliver exactly what that audience wanted. And isn’t that what good digital marketing should be all about? You must first understand what consumer group you are targeting. Then you must craft your message to appeal to that group, and then close the deal by converting their interest into actual sales. That’s the process Donald Trump took to turn himself into a viable candidate who ultimately won the biggest prize in world politics. Let’s take a look at how Trump pulled off this bit of branding, keeping in mind that this will focus solely on his marketing strategies and has nothing to do with his politics. One of the most important things about branding your company is to ensure that you are never “off-message.” It’s easy to start out with a vision of what your company stands for, but when things start to go south, a lot of business owners attempt to change their message to fit the trends, instead of remaining consistent and fine-tuning their message. When he was running for president, Donald Trump had a keen understanding that the people he had targeted wanted a candidate whose message never changed even if it was unpopular with the majority. One of the biggest signposts messages that Trump delivered was his promise to build a wall along the border between the U.S. and Mexico. Trump knew that his followers were upset about immigration policy, so he shrewdly kept hammering home the message about building a wall. Even when it appeared that polls showed the wall was not a popular mainstream idea, Trump stood by his wall-building message because it played well to his supporters. And despite the controversy Trump’s “Build the wall” message triggered, he never wavered from it, and as a result, everyone knew exactly where he stood, and it branded him as someone who had a specific plan of action for a perceived problem. When you’re trying to brand your company, one of the keys is to make sure that your marketing is as simple as possible. While other candidates were talking about specific (and complex) policies that they would implement if they were elected, Donald Trump kept his promises simple. Rather than get into the minutiae of his policy, Trump came up with a brilliant strategy in which he reduced everything he stood for into one catchphrase: Make America Great Again. Now while that may sound like a pretty thin platform on which to build a campaign, it worked for Trump because no matter what the education or experience level of his followers, everyone could understand the simplicity of making their country great once more. But notice something really interesting. Trump didn’t ask if America was no longer great, he simply stated that his goal was to make the country great again. Because by insinuating that America was broken and not up to its previous standards, Trump immediately evoked a powerful response in his target audience. He coalesced all their hopes and dreams and frustrations into one simple slogan that resonated in a way that no amount of speeches on economic policy could ever do. Make your message simple and clear so that your consumer group has no questions where you stand. If you’re a computer security software company, don’t talk about the technology that went into building your software, talk about how the software will make people safe after it’s installed. Brand your products and services by presenting them as simply and clearly as possible, so that your prospects have no questions about what you are offering them. No presidential candidate took more advantage of free social media platforms than Donald Trump, and by doing so, Trump branded himself as a master of digital information. Voters were used to candidates who occasionally used social media to express themselves, but Trump’s use of Twitter to speak directly to his supporters and to the rest of the world was at another level. As a shrewd businessman in his own right, Trump understood the power inherent in taking one’s ideas directly to the people without a filter. So while he would sit for traditional interviews to get out his message, his main platform was Twitter, and it proved to be an outstanding branding opportunity. Because Twitter allowed Trump to display what he had told people he was, a straight-shooter who didn’t play by the rules. Unlike other candidates who carefully parsed their words and said nothing that could be taken out of context or used against them in a debate, Trump let his words fly and land wherever. He didn’t care about protocol or appearing presidential. In fact, what he realized very early on in his branding efforts was that his supporters loved that he spoke in their language, raw, heartfelt and without much thought about being politically correct. When you’re trying to brand your company, social media is one of the most effective ways to accomplish this goal. Social media platforms such as Twitter, Instagram and Facebook provide you the opportunity to take your message directly to the people. And with strategies such as targeted paid ads, gamification and live streaming, social media can help brand your products and services where your consumer group gathers to exchange information and express their wants and needs. Trump’s tweets are a direct extension of his personality and they work well because you can close your eyes, listening to one of his tweets, and instantly know who sent that message. Can people say the same about your social media persona? Have you created the kind of online “personality” that is undeniably unique and your own? 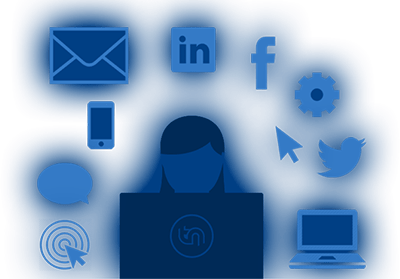 Have you branded your company on social media through a combination of expertise in your industry, shareable content and consistent engagement with your consumer group? Branding is one of the keys to effectively marketing your products and services and conveying a consistent message to prospects about what you stand for and how you can satisfy a need or a want for a customer. Whether or not you support his politics, Donald Trump proved to be a master at branding; creating a persona that was bold, unique and altogether different than any politician in U.S. history. As a candidate, Trump realized that his supporters wanted an authentic, irreverent leader who wasn’t going to give them the same old political tropes, so he deftly branded himself as an outsider who spoke his mind, expressed a simple clear message and communicated that message on the most powerful platform on earth today: social media. By analyzing this phenomenon, you can use the same tools Donald Trump did to brand your company and express a message about who you are and what you stand for in a way that your customers will not forget.